Each line represents a position on the Branch Committee. To change a name, select a new one from the dropdown list. performs. Select their current term from the Term dropdown list. The list can be re-ordered by using the Move Up and Move Down buttons. the list. The Add Committee Member button will add a line to the list. The Save Changes button will save any changes made. Changes aren’t saved until the Save Changes button is clicked. 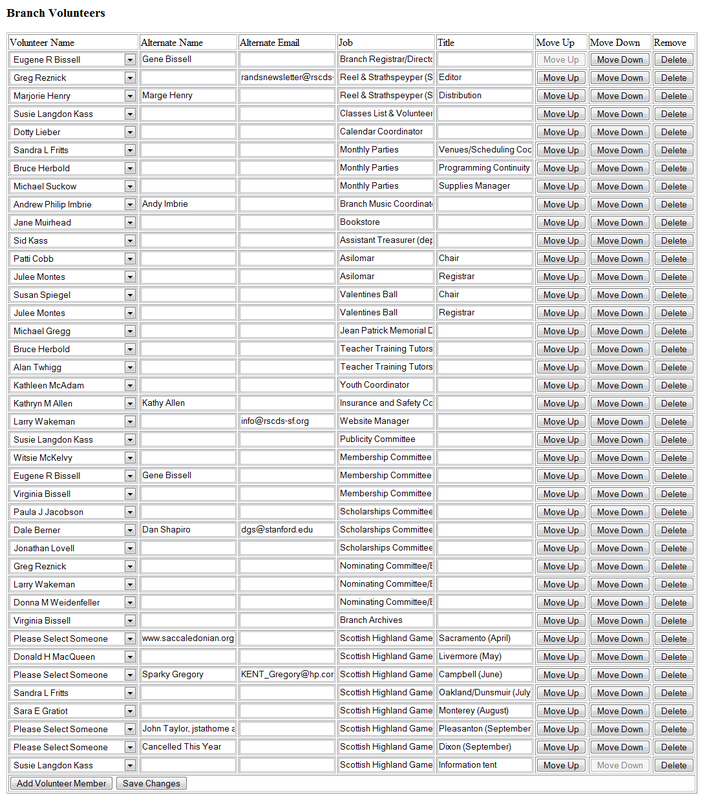 Each line represents a volunteer position in the Branch. To change a name, select a new one from the dropdown list. branch, enter their name in the Alternate Name and Alternate Email columns. These columns can also be used to change the name of email address displayed on the form. performs. If multiple people are on a committee, the Title column is used to specify their position on the committee. The list can be re-ordered by using the Move Up and Move Down buttons. The Delete button will remove the entry from the list. list. The Save Changes button will save any changes made. Changes aren’t saved until the Save Changes button is clicked. Clicking the Class Manager Email List link will bring up the following page. This page is a tool to maintain the Class Managers email alias. It presents the email addresses of the Class Managers so that they can be copied form this page and pasted into the email maintenance pages of our ISP. This information comes from the Edit Class pages. Clicking this link will display a pdf version of the Branch Volunteers list that can be printed out or saved. The normal use for this form is to right click on the links for the Download files to get the class list in text or csv format for formatting on the user’s PC using a word processor or desktop publishing application. 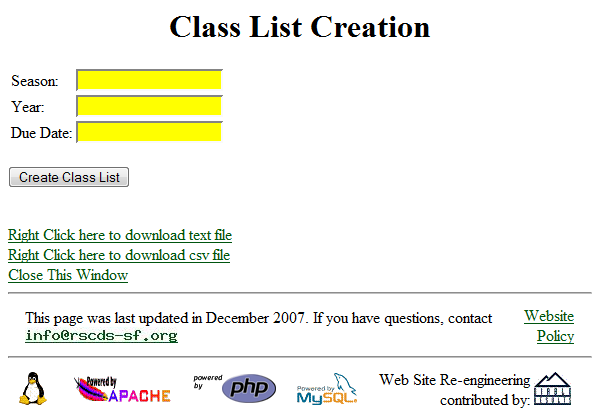 The Season, Year and Due Date textboxes and the Create Class List button will cause the creation of a Class List pdf file. more classes to list than will fit on a single page.